Animal Image offers museum-quality restoration and color enhancement for your cherished historical and family photos. There is nothing more frustrating than leafing through a family album to find your favorite old photographs disfigured by water spots, hungry insects, years of handling, or simply fading out of existence. But there's good news: using 21st-century digital technology, this damage can be reversed and your photographs restored to their original glory. All restoration work is done on the computer so there is no alteration to original photographs. Each photograph has unique restoration needs. 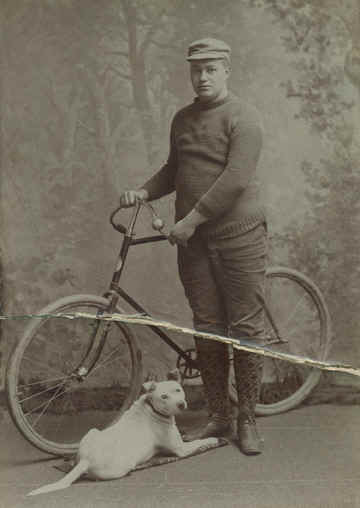 Photos such as this turn-of-the-century bicyclist can suffer from a cocktail of problems, including but not limited to micro and macro-scratches, tears, creases, foxing, water stains, fingerprint acid burns and mildew, all of which have a cumulative effect on image quality. Using digital restoration, all of these problems can be resolved. Missing pieces, uneven fading, greenish tints and even some bad hand-retouching done by the original photographer can be corrected in the course of a restoration such as this one. Not all photos are this badly damaged but even those with surface wear, color drift and exposure issues can be dramatically improved upon. Minor cosmetic changes can also be made, such as red-eye correction, the removal of undereye circles and facial lines, and in the case of modern color photos gone green, the restoration of a normal color spectrum. Once major damage issues have been resolved, then the photograph is "fine tuned" for exposure, brightness and contrast. 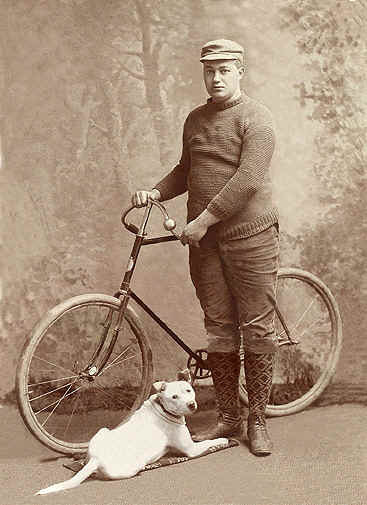 In the case of vintage photographs such as this one, a fresh sepia tone can be applied to the restored image, or it can be converted to true, desaturated black-and-white. Historical photographs can also be taken to the next level of full colonization. When color is applied, details in clothing and accoutrements become visible like never before. And for some people, seeing the face of a long-gone loved one--now refreshed with color--is a profound emotional experience. Color can be selectively applied to the subject only or to the entire image, including elements in the background, such as the painted studio backdrop in this image. Click here to see additional examples of restoration and colorization. How can I send my photo to Animal Image for restoration? You can send your photos via Federal Express, UPS, or USPS mail (please use certified or insured priority mail with delivery confirmation). I can scan prints, negatives and slides, and will return them to you after the restoration is complete. If you live in the Austin area I can personally meet with you to collect your photographs for restoration. If you prefer to hold on to your original print or negative, you can send me a high-resolution digital JPEG-scan of the picture via email or on a CD. Please contact me for guidelines before you scan your image for restoration. After a careful examination of the image, I will email you a cost estimate before any restoration work begins. Restoration estimates are based on the extent of computer time required to make repairs and are calculated at the rate of $12.00 per quarter-hour (minimum). Unless they are exceptionally damaged or compositionally complex, most photos can be repaired within an hour, with colorization taking some additional time. The turnaround time for single-image restorations is approximately a week (not including shipping). Discounts are available on restoration jobs consisting of three or more images, as well as for public museums, historical sites, libraries and archives. Please feel free to email for additional information.